On Sept 9, 1954, Marilyn Bell. 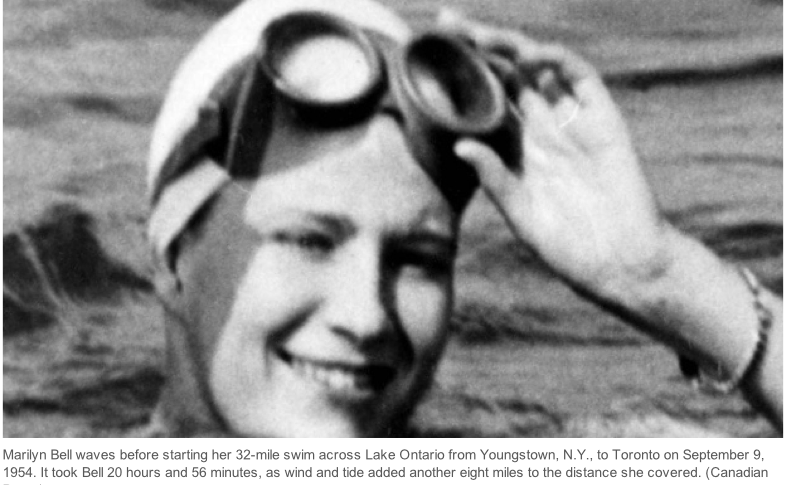 a 16-year old Toronto schoolgirl, entered the annals of marathon swimming, and left an enduring mark on Canadian sporting history by becoming the first person to swim across Lake Ontario. On January 28 of this year, I had the good fortune to meet Marilyn and, since then, the privilege of helping her return to swimming after a 16-year hiatus. Marilyn’s is among the most uplifting of all TI Stories. What better time to tell it than the 60th anniversary of her historic swim? Since age 60, a degenerative spinal condition had caused painful back spasms whenever she attempted front crawl. It pained Paul that a legendary swimmer could no longer do what had brought her such distinction, but he felt if anything could help her get her mojo back, TI could. Marilyn hung up her suit at age 18 but her fame endured. Babies, public parks, and a ferry were named after her. A quarter-century later, Canadians still considered her a sporting icon on a par with hockey superstar Wayne Gretzky. At 19 Marilyn moved to New Jersey to marry Jim DiLascio, who she’d met when he was among her safety escorts as she swam the Atlantic City Marathon. Together they raised four children—all swimmers—in Willingboro NJ, where Marilyn taught elementary school and Joe worked in state government. Paul called me on a Monday evening and said: “Would you be willing to meet with my friend Terry?” Well, how could I say no to Paul Lurie. He wasn’t only a dear friend; I was so inspired by how beautifully he swam and the enjoyment he got out of it. 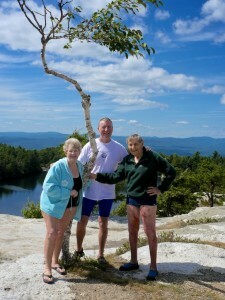 Marilyn, Paul, and Terry at the Minnewaska Distance Swimmers beach. When you showed me video of my stroke, I could recognize the way I’d been swimming was unhealthy for my back. The first exercise—Superman—brought back something I hadn’t thought about in 70 years–how wonderful it felt when I first learned to float. I’d completely forgotten that sensation. Superman also taught me to align my head and spine. I immediately felt more comfortable. But I struggled with the second drill–the Skate. Extending and streamlining each side of my body made perfect sense, but I was so used to the old focus on pulling and kicking that I felt like such a klutz. I practiced every morning between your visits. I commented to Paul how hard it was to unlearn old habits. But the TI sequence of small and simple skills, plus your advice to focus on just one thing at a time, helped me make progress every day. That was exciting. And Paul was an invaluable mentor. He has a good eye for TI technique, so he watched me closely and gave feedback. In addition, we filmed each other with my ipad and compared my form with his. Best of all, swimming is now a joyful experience. I always felt elated after completing my long swims, but swimming for pure joy is such an unexpected gift and I understand why Paul was so anxious for me to share this. My swimming has long been a source of inspiration for people–of persistence and determination. 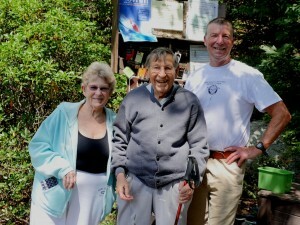 I’m excited and grateful that I might once again provide inspiration, but of a different kind–not about how far or fast you swim, but about learning something new at any age–as Paul did at 93! Swimming the TI way seems like an anti-aging prescription—not only for physical health, but as a learning challenge to keep your mind and senses sharp and your outlook fresh. You can literally learn something new each day. I’ve learned so much, yet still feel like I’ve only begun. I really want to master the form completely. I’ve always lived with a sense of gratitude, because I’ve had such a wonderful life, but this swimming rebirth has come so unexpectedly. Overlooking Minnewaska and the Catskill Mountains. On August 18, Marilyn swam in open water for the first time in 27 years, synchronizing strokes with me for 400 meters in Lake Minnewaska. See how beautifully she now swims in this video. Hearty congratulations on your re-birth! What a wonderful story, swimming again, and having such a great connection again to the water. My father, J. Douglas MacFarlane, managing editor of The Toronto Telegram, would be applauding you from the heavenly newsroom. I was so happy to see you when you visited the Canadian National Exhibition to mark the 50th anniversary of your swim. And now to see you on the 60th anniversary is extra special! As you recall, I am 60 years old, as of August 24, 2014. 1954 was the year that my fraternal twin brother, Robert, and I were born. I treasure the photo of you with us as two year old twins in our parents’ back yard. And the fact that my father also had Gus Ryder teach us to swim and had June McCormack, wonderful portrait artist, paint dual portraits of both my brother and I, just as she did a portrait of you. I am a young swimmer myself and knowing your story, it has inspired me to re-join! I don’t have much time with school and also because I have knee problems, but after reading this amazing story, I know that I can manage to re-join swimming! You are a true legend to me as we both share the passion of swimming! I am so inspired and so glad I got to read this! I can really relate to your story! And Terry, lovely job on writing this! Keep it up! Dear Marilyn, You have inspired me to swim more twice. I first took lessons in Gus Ryder’s pool in Toronto inspired by your accomplishments. Now with a weakened back after an accident I am inspired again by you and this story to keep swimming.